Do you like dogs? Are Beagles your spirit animal? Even if your answers are no, you can’t go wrong with this amazing inflatable! 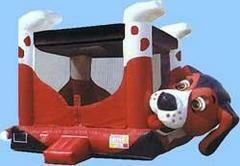 Perfect for the youngsters that love jumping on beagle bellies! They get a generous jumping area to act like crazy beagles and they are shaded to boot! Surrounded by shaded enclosed netting a breeze is the best thing to flow through.